welltree Stainless Steel Plate/Dish Set - Best for Backpacker or Camping, Ideal for Toddlers and Kids by welltree at Kerinci. MPN: GD17SSPL. Hurry! Limited time offer. Offer valid only while supplies last. 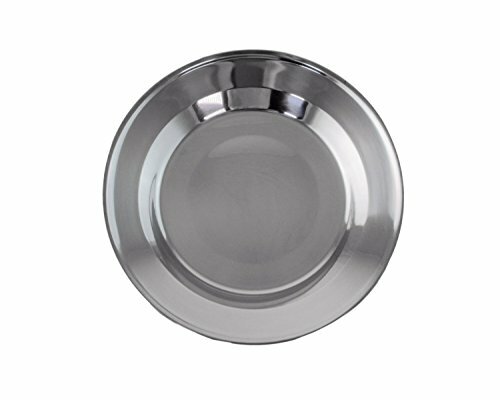 You will fall in love with this stainless steel plate that doubles as a small wide bowl!LIGHTWEIGHT - These steel plates only weigh 5 ounces each. You will fall in love with this stainless steel plate that doubles as a small wide bowl! LIGHTWEIGHT - These steel plates only weigh 5 ounces each. (Available as one or sets of 3.) This makes them ideal for camping dishes or backpacking as well as being light enough for a child or toddler to hold. GUARANTEE - We offer a 90-day, no hassle money-back guarantee! Use your plate for up to 3 months and if you are not happy, simply contact us, return the item and get a full refund of the purchase price. LIGHTWEIGHT STURDY CAMP BOWL-PLATE - these 5 ounce steel plates can double as shallow bowls and they nest to take up less storage. Use for eating or mixing! TODDLER / KID FRIENDLY - great replacement for plastic dishes and easy to clean, eliminate germs and unbreakable. The flat rim base provides stability. USE EVERYWHERE Indoor or outdoor - dinnerware great for camping, picnics, patio, kitchen, cocina, or even a restaurant. EASY TO THROW in a backpack, diaper bag or just keep in the car for emergency snack, lunch or survival. If you have any questions about this product by welltree, contact us by completing and submitting the form below. If you are looking for a specif part number, please include it with your message.